In the town of Glastonbury, paranoia about the travellers’ camp at Greenlands Farm – see Greenlands Farm – Part 1 – was reaching fever pitch, for the “Children of the Rainbow Gathering” was now gathering pace. As far as stout Glastonburgers were concerned, Woodstock II was imminent. As far as the police were concerned, the Monmouth Rebellion had returned to haunt them and nervous reconnaissance patrols fanned out across the Somerset Levels, seeking anything suspicious … such as crowds of peasants waving pitchforks. The next day, in a muddy Sedgemoor rhyne, a police scout found a book by John Michell called Stonehenge, its Druids, Custodians, Festivals and Future. It listed an exotic medley of mysterious groupings that claimed a behind-the-scenes “involvement” with the annual Stonehenge Festival. With this discovery, a frisson of fear tingled through the higher echelons of the local constabulary. Their colleagues in Wiltshire had only recently suppressed the Stonehenge Festival, and the suspicion now was that these hitherto unknown groups might also be coming to Greenlands, bent on revenge. Their anxiety was heightened when forensic examination of the book revealed minute traces of Bronze Age burial-mound. The orders were hurriedly changed. Smock-wearing peasants were now to be almost ignored. The new search was for any and all of the following: the Magical Earth Dragon Society, Polytantric Circle, the Ancient Order of Pagans, Pendragon Circle, the Union of Ancestor Worshippers, Devotees of the Sun Temple, Mother Earth Circle, the Family, the Tibetan-Ukrainian Mountain Troupe, the Church of Immediate Conception, the Tipi Circle, the Wallies, the Free High Church and the Rainbow Warriors. Most of the constables griped and grumbled at this. How were they supposed to spot such people? A peasant is easy to recognise, but what might an Ancestor Worshipper look like, or a priest of Immediate Conception? Some muttered darkly that the only “Wallies” to be found were those in the rank of Chief Inspector and upwards. Trawling books on everything from the Arabian Nights to The Fabulous Legends of Chimera, police artists issued streams of fanciful drawings based on what were called “mytho-type profiles”. Jungian psychologists and professors of anthropology were flown in by helicopter to give advice; and two junior constables went missing, lost on the moors, never to be seen again until much later (in fact several years later, but that’s another story). However, and as history records, it was all to no avail. Soon after moving to Avalonia I bought a copy of the local newspaper, intending to scan the “Accommodation To Let” adverts. But I got no further than the front page, which expressed shock, horror and outrage over the arrival of “The Convoy” [see Medieval Brigands] at a place called Greenlands Farm. I almost fell over. It couldn’t be true! No! I’d just escaped from all that [see Molesworth Green Gathering]! It was done with, finished! I’d only been in Glastonbury a few days – surely these people weren’t actually following me around the country? 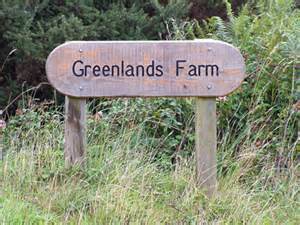 Needing to find out the truth, I set off to search for Greenlands Farm and check out this wild story. Having walked through shady Wick Hollow and skirted the Tor to my right, I passed a couple of local farmers who were leaning on a fence, anxiously chewing straws and clearly agitated by the news, apparently just in, that a mysterious Swami [see Swami Bharmi’s Ashram Acolytes] had elected to join the burgeoning encampment. “Whatev’r be ‘e thinkin’ arv”, said the grizzled sod-buster to his neighbour. As I drew closer to the hamlet of Wick itself – and thence Greenlands Farm – my thoughts wandered back to my first encounter with The Convoy, when I was living in the city of Bath. They’d arrived out of the blue, occupying the rugby fields on the edge of the city. The local paper reported outbreaks of hepatitis, the rugby fixtures were cancelled, the city council met in emergency session and the populace seemingly teetered on the edge of panic: Genghis and his Mongol hordes were poised outside the city walls, ready to sweep down upon us. As dusk fell, I had walked out along Bath’s London Road to see for myself. Getting nearer, I heard the sound of voodoo drum beats … dum dum dum Bah, dum dum dum Bah, dum dum dum Bah. Smoke trailed upwards. The light from what seemed like hundreds of camp fires flickered in the sultry gloom. I continued onwards. The drums were very loud now. Dum dum dum Bah, dum dum dum Bah, dum dum dum Bah. As I turned onto the Rugby Field track, there it was – a huge sign in lurid, dripping red paint: “Welcome to Doom City” …. The original aim at Greenlands had been to establish a semi-monastic, land-based Christian community (the first near Glastonbury since the dissolution of the Abbey under Henry VIII, 450 years ago). The farm was run on the principle of kindness to animals. And the owner, being short of labour and farming expertise, had opened the farm to anyone – ideally pilgrims to Glastonbury – able to help on the farm in exchange for a place to live. This, by a long and tortuous route, had eventually led to the midnight arrival, in twos and threes, of Rainbow Fields (Village) on the Road  and a few other assorted “Convoy” types. The fuse – or Wick – had been lit. What became known as ‘The Hippy Wars’ had begun, and with it a 24-hour police watch on the farm. In the next 26 weeks this titanic struggle was to feature no less than 21 times in the front page headlines of either (and usually both) the Western Gazette or the Central Somerset Gazette. It was indeed an epic saga, a bit like The Archers, conveniently serialised in weekly parts: “The Greenlanders – an everyday tale of country folk”. Initially, at the time of my first visit, there were only a small number of travellers at Greenlands. The Swami, however, from his long years in the mountains, had learnt to think big. Quickly adopting the appropriate lingo, he announced through his many acolytes a “Children of the Rainbow Gathering” in the “Free State of Avalonia”. The news spread like wildfire. A further 300 travellers arrived and the town was gripped by hysteria – or was it the other way around? Sri Ananda Jacaranda was content to let the chaos flow around him. When pressed by reporters he smiled serenely and described life in the Greenlands’ orchard as “muddy fun”. When pressed even further, he raised his hand to quell the general hub-bub and said, “If you push something hard enough it will fall over”. The assembled press scribbled furiously, evidently expecting more, but His Holiness stepped into the ashram and would not come out, despite repeated cries of “Please Mr. Jacaranda, give us a statement”. This stand-off continued for some hours, but the Swami’s aloofness only added to the density and fervour of the media pack outside, especially since news had now reached them from the slopes of Glastonbury Tor of his earlier pronouncement (i.e. “Nothing Once Known is Never Forgotten”). The name adopted by remnants of the ‘Rainbow Fields Village’ following their eviction from Molesworth air base [see Molesworth Green Gathering]. A long-running radio drama series here in the UK.